Enjoying time in log cabins off the beaten track is a way of life for a lot of people in Sweden. And the appeal is so strong most of them don’t let a bit of snow – or even a lot of snow – put them off. Which is probably as well really because 20 years ago Swedish car maker Volvo introduced its first Cross Country model to enable those hardy enthusiasts to get to their holiday homes without having to worry about the weather. Now two decades and several Cross Country variations later that heritage has enabled Volvo to produce its latest and best off-road-capable estates in the form of the V90 Cross Country. 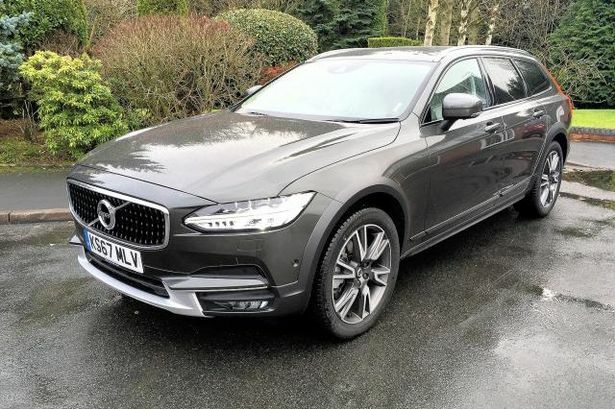 The Cross Country model is the more rugged version of the standard V90 estate and because it’s designed to be able to tackle off-road work has 65mm more ground clearance than the regular model and is distinguished by its lower sill and door mouldings, its wheel arch mouldings, silver front and rear skid plates and larger door mirrors. Unlike on earlier models, however, Volvo has chosen to make this one a less obvious 4x4 and even the Cross Country name emblazoned on the rear bumper has body coloured lettering so you have to look closely to spot it. This is a car for people who need a 4x4 but don’t necessarily want to be seen in something with the bulk of a Range Rover or Mitsubishi Shogun. Nevertheless the V90 is a big car, offering limousine-like legroom to all five passengers and a generous luggage area of some 1,526 litres beneath a power operated tailgate. The executive-like interior is a nice blend of modern Swedish styling and quality materials with leather faced upholstery and tailored instrument panels and door tops in saddle stitched leather. The 2.0-litre, 235bhp engine makes light work of pulling this big estate and the interior is remarkably quiet even on full power, helped in part by double glazed side windows (a £750 optional extra). The eight-speed auto box is seamless and refined and drivers have a choice of varying the ride and performance from eco to comfort and dynamic. And while the Cross Country has permanent four-wheel-drive the fourth ride option is an off-road setting for when the going gets really tough. Because of the car’s long bonnet it can be difficult to see what you are about to encounter as you reach the top of a steep off-road gradient but Volvo has thought of this, and you can use the on-board camera to see everything ahead of you on the nine-inch centre console touchscreen as you approach the top of the hill. And a rear view camera for reversing makes light work of parking a car which is more than 16 feet long. Like all Volvos it’s packed with high tech safety features as well as one of the best voice control systems in the business so you can simply tell the car what you want – like increasing the temperature or changing the radio station – without having to take your eyes off the road. It will even book itself in for a service when it reaches the appropriate mileage. Clever people these Swedes, although the log cabin attraction in winter still seems a bit alien to me. Mechanical: 235bhp, 1,969cc, 4cyl diesel engine driving all wheels via eight speed automatic gearbox.